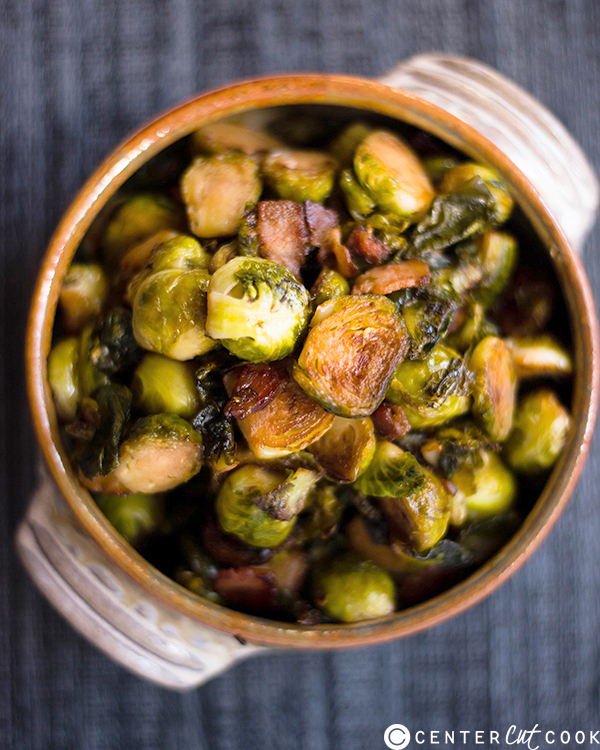 Enjoy the best that brussels sprouts have to offer with a sweet and savory preparation. Seriously, is there anything maple syrup or bacon isn’t good with? It feels like I keep reading about maple-roasted brussels sprouts and/or brussels sprouts with bacon so I thought I’d try to make a combination of all the goodness with these maple and bacon brussels sprouts. But, instead of roasting them, I wanted to make a recipe that was even faster. While roasting is an amazingly awesome way to add a lot of flavor to your food, it can take quite a bit longer compared to cooking on the stove top, depending on what you’re cooking. I didn’t want to add too much oil or fat to this recipe from the bacon, so I kept it at just 1 slice and I used thick sliced applewood bacon (but any bacon will do). Just remember that the better quality bacon, the better flavor you’ll get in the final dish. These maple and bacon brussels sprouts are super addicting and a great way to get non-brussels-sprouts lovers to try brussels again. Because who doesn’t lover maple syrup and bacon? Heat a large sauté or frying pan to medium-high heat. Add the diced bacon and cook for 1-2 minutes, or until it starts to sweat. Push the bacon to the side of the pan and carefully place the Brussels Sprouts cut-side down in the pan, as much as possible. Cook 4-6 minutes or until the Brussels Sprouts start to brown. Then, stir to incorporate the bacon into the Brussels Sprouts. Season with the salt and pepper, stirring frequently. 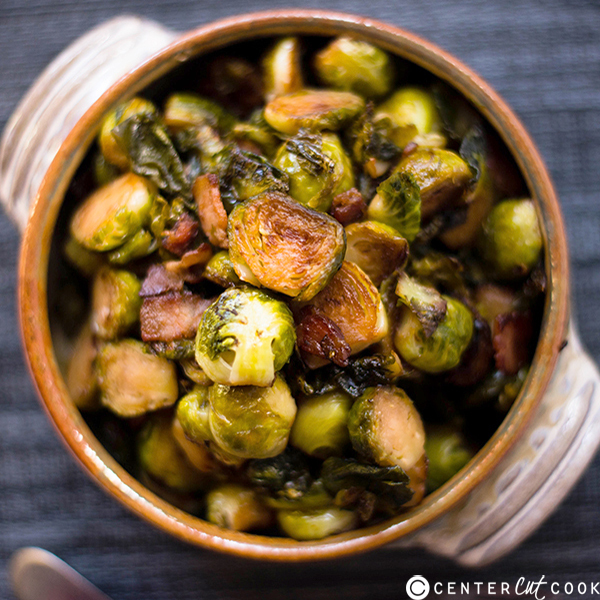 Cover the pan and continue to cook, stirring frequently for 3-4 minutes, or until the Brussels sprouts become mostly tender and the bacon becomes almost crispy. Add the maple syrup, stir, and cook for an additional 1-2 minutes, uncovered.